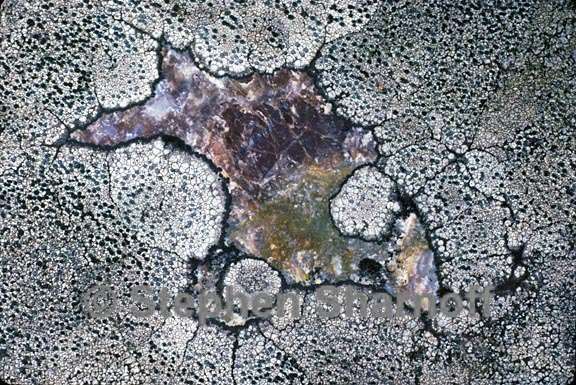 Life habit: lichenized or lichenicolous Thallus: crustose, placodioid, with radiate-plicate marginal lobes, areolate towards the center surface: white, light gray to gray, greenish yellow, ochraceous, light or dark brown, shiny, dull or pruinose vegetative propagules: absent photobiont: primary one a Trebouxia species, secondary one absent Ascomata: apothecial, initially cryptolecanorine, finally becoming lecanorine or lecideine, first innate or immersed, becoming adnate or sessile disc: black or pruinose, plane or becoming convex; epihymenium: brown hymenium: hyaline, I+ blue; paraphyses: simple or weakly branched; hypothecium: hyaline or pigmented brown asci: cylindrical, Bacidia-type, 8-spored ascospores: brown, 1-septate, Beltraminia-type, possessing a distinct torus around the septum Conidiomata: pycnidial, globose to pyriform, immersed in the thallus conidia: hyaline, simple, bacilliform Secondary metabolites: usnic acid, xanthones, orcinol depsides, ß-orcinol depsidones Geography: world-wide Substrate: on acidic rocks. Notes: Dimelaena is characterised by a thallus with radiate-plicate marginal lobes and ascospores with unthickened wall, the presence of apothecia which are initially cryptolecanorine but finally become lecanorine or lecideine, and a dark hypothecium in a number of species suggests that Dimelaena is more closely related to groups of Buellia s.l. than to Rinodina. This view is supported by the presence of Bacidia-type asci with a conical axial body and Beltraminia-type spores.